Kirkhope Aviation has spent a great part of the past 40 years touring Outback Australia by air, and we’ve pretty much seen it all. Here are our top five destinations that you need to see from the air on a scenic flight. As far as iconic Australian locations go, this is the one that international guests all seem to know. Rising from a flat and endless desert, Uluru stands 348m tall and can be seen on the ground from over 65km away. Despite its tall stature and 9.4km circumference, it’s difficult to truly appreciate the scale of this icon without getting above it. Flying over Uluru is an ethereal experience. Whether by helicopter or aeroplane, you’ll grasp how this landmark sits above a beautifully bare landscape. Stunning at any time of the day, both Ayers’ Rock Helicopters and Professional Helicopter Services also offer flights at sunrise and sunset. The colour of Uluru changes dramatically as the sun sets, making for a simply spectacular end to any day. Visitors flying into Ayers Rock Airport may also get a taste of this as they fly in, so keep your eyes out the window on descent. The largest mountain range in South Australia, the Flinders Ranges stretch for more than 400km from Port Pirie to Lake Callabonna. A history of mining throughout the ranges has been now replaced with conservation and tourism, and the area is popular with bushwalkers, mountain bikers and those with off-road vehicles. In the centre of the ranges sits Wilpena Pound, a large natural amphitheatre once used to contain stock. Visitors can drop into Wilpena Pound Resort to the northern of the pound itself, or Rawnsley Park Station to the south, and hike around the area. Taking a different perspective, Chinta Air offers scenic flights from Rawnsley Park Station, and Air WIlpena offers them from the resort. Heading further north, Arkaroola Wilderness Resort is perched on the northern end of the ranges. Set on land that was originally determined unsuitable for pastoral use, the resort offers stunning walks and a unique 4WD tour through over 40km of the most rugged tracks in the ranges. Manager Doug Sprigg is also Chief Pilot of Arkaroola Air Services, and scenic flights are paired with his unparalleled knowledge of the area and its geological significance. Taste of the Outback, Kirkhope Aviation’s 3 or 4 day Outback Australia tour, visits the Flinders Ranges for one night, including a scenic flight over the ranges. Massive tidal movements, combined with two small gaps in the McLarty Ranges in the Kimberley, give rise to a spectacular flow of water that has earnt the title of the Horizontal Water Falls. Combine this with its remote location and naturally a scenic flight becomes the best way to see this spectacle in motion. Located north of Derby, Western Australia, several operators offer flights over the falls in aeroplanes and helicopters. 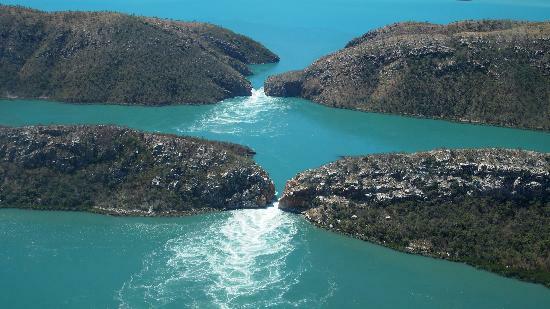 Horizontal Falls Seaplane Adventures combines flights with a boat tour, making for half and full day experiences. King Leopold Air, North West Bush Pilots and Broome Aviation provide scenic flights for those looking to see the falls on a tighter timeframe. Kimberley Air Tours also offers flights from Kununurra for those coming from the east. The Horizontal Water Falls also features on Kirkhope Aviation’s Kimberley and NT tour, a 14 day adventure crossing central Australia to explore some of the most remote and pristine towns in the country. Purnululu National Park is a World Heritage Site home to distinctive rock formations known as the Bungle Bungles. Over millions of years, wind and weathering have created domes of rock, commonly compared to beehives. The park is accessible by 4WD and offers stunning walks as a reward for an arduous drive, however to truly appreciate the Bungle Bungles you need to get above them. With Lake Argyle glimmering in the distance, look down into the network of canyons and valleys between the domes as you fly over the national park. The distinctive rock formations protrude from the otherwise flat terrain, and in the late afternoon the shadows and colours created by this definitely worth enduring the heat of the afternoon. Nearby Kununurra is the closest major town, with several operators providing scenic flights and day trips to the ranges. Kimberley Air Tours, Aviair and Shoal Air offer flights in fixed wing aeroplanes, with HeliSpirit offering helicopter flights and tours. Kirkhope Aviation’s Kimberley and NT tour also drops into the Bungles for an overnight stay and a scenic flight overhead. Officially known as Kati Thanda–Lake Eyre, the largest lake in Australia (as well as its lowest point) is widely known for the stunning white salt crust that seems to go on forever into the horizon. Covering 9,500km2, appreciating this national park is almost impossible from the ground. At a minimum you’ll need a very decent 4WD, a lot of time and a lot of water, and even then you’ll want to visit in the dry season (April-September). Wrightsair has made its name touring this part of the country, and they offer a fantastic range of flights. Based in the tiny settlement of William Creek, Lake Eyre is only a couple of minutes away by air, but seeing the whole thing can take upwards of two hours. Flights are also available from other locations including Birdsville, Marree, Wilpena Pound and Rawnsley Park. Doug Sprigg of Arkaroola Air Services offers flights as well, combining the Flinders Ranges with Lake Eyre and Lake Frome for a spectacular day out. Kirkhope Aviation’s Taste of the Outback tour from Melbourne features Lake Eyre, with a low level scenic flight down the Diamantina River. Follow the water as it flows down to the top of Lake Eyre, then watch it expand out into the basin. We had a marvellous trip to Flinders and King Islands and Tasmania. Flying on a small plane is so much fun. We all loved the birds eye view of Wilsons Prom and beyond, Flinders Island, north west Tasmania, King Island and flying over the heads and over Port Philip Bay on the way home.